A choral musician's blog: Fabulous concert weekend! John Tenniel's illustration of Jabberwocky. I hope you don't have any important plans for this coming weekend, because it is going to be a GREAT concert weekend! Being the second weekend in May, of course there are a billion choral concerts. But the one I want to call to your attention is, of course, my own! Cantilena will be performing their spring concert, called "Poetic License." This performance is in honor of Mordena Babich, a member of our alto section who passed away last spring. She was a writer, so in her honor we have chosen musical settings of all the best poets. Jane Kenyon, E. E. Cummings, Yeats, Shakespeare, and others will all be represented. 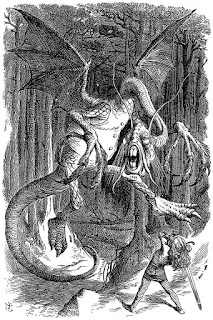 And we will be performing the world premiere of a commission by Scott Wheeler, his setting of Lewis Carroll's "Jabberwocky" for two cellos and women's chorus. It's a very exciting program and I hope you can come! For more about our commission, check out the interview I did with Scott Wheeler. If that is not enough choral music for you, I also feel that I owe a nod to Musica Sacra, who always has the most interesting programming, and this weekend is no exception. This year is the 150th anniversary of the Emancipation Proclamation and the Gettysburg Address, and Musica Sacra will be celebrating these events. To quote from their press release, "In this Saturday's concert, music from and about the Civil War period will be interspersed with readings of texts by Frederick Douglass and Abraham Lincoln, performed by drama students from Cambridge Rindge and Latin High School." I greatly enjoyed Musica Sacra's March concert, "Baltic Inspirations," where they explored some stunning Northern European music that had a truly head-spinning quantity and variety of languages. (And I felt a little guilty for not reviewing it on the blog!) So go check out Musica Sacra for a very patriotic Saturday...and then come see Cantilena for a poetic and inspired Mother's Day! I find your blog very interesting. some thing just don't make sense. Thanks for your comment, teal celo! If you are interested in reading about conducting, then I highly, highly recommend the blog Thoughtful Gestures, which really delves into the whys and wherefores of conducting. Happy reading!